When Peter Gee and Steve Butcher started GB Heating and Plumbing Services 25 years ago in Pinner, Middlesex, their goal was simple. The pair who met when they were British Gas engineers were determined to build a plumbing and heating company which put the customer first. Since 1989 GB Heating customers across Pinner, Harrow, Ruislip, Hillingdon and Middlesex have received the highest levels of customer care and quality workmanship. The firm specialises in gas and central heating work, boiler installations, plumbing, power flushing, bathroom installations and Landlord's Gas Safety Certificates. The friendly, fully Gas Safe qualified engineers are supported by a team in the office based in Cannon Lane, Pinner. So from your initial call to when the engineers tidily finish the job GB Heating ensures it's a smooth, stress free experience for clients. When you choose GB Heating you're benefitting from a great reputation which has taken more than a quarter of a decade of hard work, customer care and integrity to earn. That's why we say Our Reputation is your Peace of Mind. Whatever plumbing, gas or heating question you have give us a call for friendly, honest, expert advice. 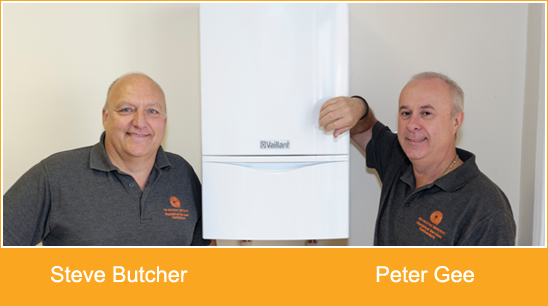 Steve Butcher and Peter Gee started GB Heating & Plumbing Services 25 years ago and have been serving the people of Pinner, Harrow and Middlesex ever since.